Bridal Bouquet Personalised Photo Charm - Heart Shaped Locket, available in different colours. 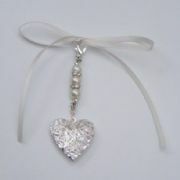 Lovely Keepsake Gift for a Bride to use on her Wedding Day. 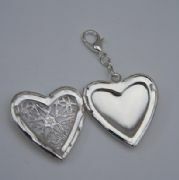 Bridal Bouquet Photo Charm - Heart Shaped Locket Double Charm Style, available in different colours. Lovely Keepsake Gift for a Bride to use on her Wedding Day. Bridal Bouquet Photo Charm - Heart Shaped Locket Elegance Style, available in different colours. 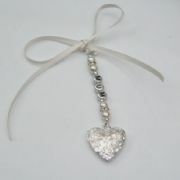 Lovely Keepsake Gift for a Bride to use on her Wedding Day. Bouquet Photo Charm - Heart Shaped Photo Locket, Beaded Style Clip On Charm availabile in different colours. 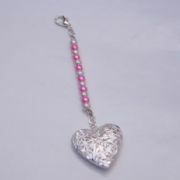 Lovely Keepsake Gift, that a Bride could attach to her Wedding Bouquet in Remembrance of Lost Loved One's. Bouquet Photo Charm - Heart Shaped Photo Locket Clip On Charm. 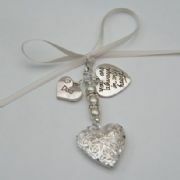 Lovely Keepsake Gift, that a Bride could attach to her Wedding Bouquet in Remembrance of Lost Loved One's.